MailChimp is the main program used to send out registration emails. It is an online database and mass emailing service. We maintain a free account through them. Online Registrations Closing Tomorrow - Mar 1 (actually closed on Mar 3rd - this was the Sunday before the conference). Log into the conference www.MailChimp.com account. Obtain the login information for the committee Secretary/Website Administrator. Campaigns - Lists prior emails that have been sent. Templates - Create a new email template or create a new one based on past emails. Lists - show mailing lists. Those who are subscribers are people who have registered for past conferences. When you are ready to export data to prepare spreadsheets for the conference committees, click on the drop down arrow next to the “Stats" button to export. If you need to create a new list you can also do that from this page at the top. Go to the Template page - here you can create a new template or base on a past template. Typically we’ve based on past, but up to you! If creating a new one follow that tab at the top of the page to design. Instructions below are for if basing on an old template. Select the past template to base the new one on and click the down arrow next to “Edit”. Select “Replicate”. From the page that opens, rename the name of the template at the top of the page and begin edits. Be sure to rename first so that it is not confused with an old template. Edit email template as desired using the by clicking on desired areas or adding content. Be sure to include the social media links and unsubscribe dialogue at the bottom of the page. Be sure to verify all hyperlinks are set and that the size of any pictures are reasonable size. MailChimp will prompt you if the photos are too big and suggest edit size. When done editing click on “Preview and Test” at the top of the page prior to sending. Each email should be sent to a couple committee members (Chairperson and Secretary) as a test prior to sending to the whole list. Once the email goes to the whole mailing list it cannot be retracted and there is a limit to how many recipients can be mailed to in a day. If a correction email needs to be sent it will have to be after 24 hours have passed. To: select which list you want to send to. Most times you will want to send to the “A.S.I.A Women’s Conference” list as that will send to all who have expressed interest in the past. Send or schedule when to send at top of the page. Contact Hong Kong branches for domestic helpers list of attendees. In the past the HK International District Relief Society President has helped with gathering this information. A HK committee member can use the LDS Tools app to get this contact information for you. Recommend giving a deadline the week of registration closing and a check in about a week prior. Below is an email with information regarding the A.S.I.A. Women’s Conference to be held March 8-10 in the Wan Chai building. The committee is hoping for your support in gathering registration information from the Filipino branches. My understanding is that this cannot be announced during church (like in Relief Society) as it is not an official church sponsored event although approved of by the church, but can be sent via email, WhatsApp or passed around at an activity or after church. If you can assist in getting the signups around and return copies via email or photo to me (______@___.com or Whatsapp ____) by February 22nd at the latest we’d really appreciate. 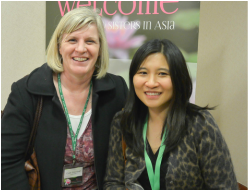 Alternately sisters can sign up directly on the website at www.asiawomensconference.org . We hope this will be an uplifting event for all. Join us to be spiritually fed by our presenters, make a difference with our service project and get to know your fellow sisters from across the Asia Area of the church. • The conference fee of 200HKD will be accepted (in Hong Kong Dollars only please) at check-in starting Thursday evening at 5:00 p.m.
• The fee includes lunch on Friday and a light breakfast Saturday morning. • The opening and closing sessions (Thursday evening and Saturday morning) are open without cost to any who are able to attend just those sessions. • If the conference fee is a hindrance to your ability to attend, please contact the conference committee at asiaconference@gmail.com for assistance. 8:50 am Breakfast "on the go"
Find out from the Conference chair who the keynote speakers will be and their bio to use in the Keynote speaker email campaign. Get names of visiting authorities needing name tags from Conference chair, these will be added to the spreadsheets when registration closes. Make note of number of registrations at the end of each month to help estimate if more reminders for registration need to go out. This date will also be on the data export from MailChimp if you need to look back on later. Prepare two laminated signs with the conference logo to be hung on the wall over the registration tables. Suggest bigger than A4 size so that people by the elevator can see. They should say “Registration Step 1, Start Here” and “Registration Step 2” or something to that effect. Talk to the Graphics or Facilities Committee as they may prepare for you - check with them if you need help getting. Make sure all domestic helpers, visiting authorities and last minute registrants are added. Also double check that all speakers and committee members have registered and record their lunch selections if needed. 3. Clean up the Excel sheet by removing CAPS, checking spelling of countries etc. Then alpha order each column one by one to catch any inconsistencies (ie Hong Kong could be: HONG KONG, HongKong, hong kong, HK…. Make them all Hong Kong). Cities / Countries: Check spelling. Some type Hong Kong, China, which should all just say Hong Kong to distinguish from Mainland China. If they are from Hong Kong or Singapore, just list the country to avoid redundancy and leave the city blank. For USA participants, list their state in the city field. If people have listed their district or military base, do a google search to find out what major city it is near and change to that. We don’t want to get too detailed on the cities. Non-paying Attendees (Finance Committee) * this list will include all General Authorities/ spouses, Keynote Speakers if not regular conference attendees and Filipina sisters not attending Friday through lunch. Before printing, email the 1st draft of the master excel file to the committee edit and approve. The master excel file will hold all the spreadsheets for the various committees. You should be the only one to update the master file to maintain it’s integrity so ask for any updates to go through you. After the conference you can send in your final version for the conference archive. The most important sheets to get to the committees first are the graphics committee and food committee since they will need to order name tags and food. These sheets should be completed and sent to the committee chairs the day after registration closes. Plan to spend a few hours getting spreadsheets in order the day after registration ends. Attention to detail is important for this step. In addition have a copy of all committee spreadsheets for you as a back up. Print right before going to the conference to make sure we get all the last minute people- can also reprint at business centers at the hotel). If you would like to see the master spreadsheet file from last year as a reference ask the conference chairperson or conference secretary. Paying Attendees - Alpha order by attendee last name , first name, city and country. Non-Paying Attendees: columns for last name, first name, branch, country, attendance day. Top section list names of visiting authorities from Conference chairperson and add. List first name as “Sister” or “Elder”. Below that section organize non paying Filipina sisters by day attending and last name. Walk-In Spreadsheet - Columns for last name, first name, country, email and lunch request. Columns - last name, first name, city, country and days attending conference (if not all). Add people from the online registration to spreadsheet first. Under that add the people from the Non-Paying spreadsheet (including General Authorities/ companions, non - registered speakers, and Filipina sisters). For the General Authorities their entire name should be listed in the “First Name” column (i.e. Elder Randy Funk in the “first name” column). This will ensure the font sizing is consistent for their whole name. Make sure this document is synchronized with the finance committee’s document after any changes, so finance committee is as prepared as possible on check in morning. Confirm the graphics committee will bring extra blank name tags for walk-ins (~20). It may also be a good idea to print name tags for other Area Authority presidency members to have on hand just in case they attend. Send this sheet to the Graphics committee chair and have them review/ approve as soon as registration is closed and you put it together. They will need to send this file to the printer asap. Note - the graphics committee will print country names for photograph from this spreadsheet as well. Photography Volunteers Spreadsheet: See below under #5 for volunteer. No need to print these spreadsheets for them - just email to committee chair when ready. This committee will need as soon as completed when registration closes to pre-order food and estimate how many extra lunches to order. Columns: Alpha order lunch selection (repeat on each line and color code the cell to match what sticker color they will receive - this will greatly ease the sticker distribution at registration) , last name, first name and notes. Insert an Excel row under each lunch selection section, then add the total of all of that selection together: “Chicken Salad, 24”. *Be sure to ask the Food Committee chairperson how many extra meals and what type are going to be ordered as you will need this information for preparing / handing out lunch stickers at registration. *Note some attendees will sign up to help in up to 3 different categories so ensure they are listed on each spreadsheet. All: Columns - last name, first name, email, country. First alphabetize the ‘service’ column so you have all those who have offered to help grouped together. Copy and paste these attendees into their respective volunteer opportunity tab (facilities - cleanup, food or service). Next, insert an excel row under each type of service selection section, then add the total of all of that selection together: “Final clean up, 14”. No need to print these pages - just send to each respective committee chair when complete. Volunteers sheets go to Facilities (clean-up, set up), Food, Service and Photography. Set up 2 long tables (Facility Chair can locate) with laminated “Registration Step 1, 2” signs above on the wall. Avoid having tables across the room facing each other. Attendees will not see the other tables down low when the room fills with people. The tables need to move in flow of check-in. Registrants will move into the service project so try to keep flow natural. Portable speaker and playlist of modern lds songs (women vocalists). Put this near the entrance of the registration foyer. The portable speaker will need to come from a committee member - there is no portable speaker belonging to the conference at this time. A great source of music is the free LDS Youth App. There you can press play and it will automatically progress through the 88 (at the time of this conference) modern LDS songs on there. Printed excel file for Finance committee - Walk-in sign up, Paying registrants and Non-Paying registrants. Finance committee will come prepared with their own cash box, highlighter, pens and cash change. Food stickers - prior to registration opening, count out the correct number of colored stickers to match the number of meals of that type ordered. Also separate the extra meals (food committee can tell you the number and type) in their own stack so that you know which stickers you can give to walk-ins on Thursday night. Don’t put stickers on name tags before check-in because we don’t know who may not show up. No show food stickers are handed out to walk-ins at day 2 registration. * You may also want to get the first floor registration table / table cloth for Day 2 ready in the first floor gym if you are moving things anyways on this night. See Secion F below for details. Attendees first check in with finance to pay before doing anything else. People may try to get their name tag first. Redirect them to pay first and point to the “Step 1” sign. Encourage them to write their name on the program and direct them to the name tag table - program supply is limited! Find the attendee on the lunch spreadsheet. Let the attendee and Rep 3 know what color sticker they need. Notes can be used to indicate if someone has ordered lunch, but no longer wants. If this happens document and move a sticker of the corresponding color to the stickers for available lunches for walk in at registrants. Help the attendee find their name tag. Place the corresponding color-coded sticker they’ve just learned from Rep 2 on the back of the name tag before they put it into the plastic name tag holder. 1. Watch the name tags at registration like a hawk! Lots of people are drawn to their names in pretty colors and may skip the payment portion / lunch sticker and just grab instead of following the process. Gently redirect to first registration table. This will save the Finance Committee from having to chase people down for payments later. 2. Walk-in attendees can get a lunch sticker Thursday evening on a first come first serve basis if extra lunches were ordered by the Food Committee. When there are no more extra lunch order stickers let them know that they can get a lunch sticker the following morning at 8:30am on 1st floor, after all other attendees have checked in and we have an inventory of what is still available (as communicated in our registration flyers: ‘pre-register to ensure you get your lunch selection of choice’). Remember to play that lovely music you’ve arranged during the registration period! After registration is over clean tables, but leave up for service project to use. Store supplies for next morning registration on 1st floor. Flowers will be moved to the presenter rooms. Check with Facilities chair for exact locations to move flowers. (move to 1st floor near elevator foyer area), same packing list as yesterday (see Phase 4). Gives late attendees the color-coded circle sticker based on what they pre-registered (same spreadsheet from yesterday). One Table , 1 or 2 committee chairs: Registration and Finance (if still collecting money). Put out name tags / lanyards for Filipina sisters only attending on Saturday. Finance Chair collects money if any paying registrants have not done so yet, check off on printed excel file. Saturday only participants do not need to pay. Have walk-ins sign on walk-in sheet. Give them a blank name tag and lanyard. Announce from the podium (after closing prayer) that all lanyards need to be dropped off in the large bowl on the table near the elevators. Put the bowls out prior to the final session closing. It’s a good idea to have one person collecting lanyards at the table and 1 or 2 people collecting by the elevator or by chapel doors. People will forget and accidentally take if we don’t remind them. Group the lanyards and plastic card holders in sets of 50, rubber band them to keep them from getting tangled or damaged. Return all registration supplies to plastic storage bins. Tablecloths go Facilities Chair for laundering. Table is stored in the gymnasium or returned to room borrowed from. Add all walk-in attendees to MailChimp database (List - A.S.I.A. Women Conference - add subscriber). Get copy of registration sheet from Finance if needed. Email event chairperson any recap notes or suggested adjustments for the following year. Final numbers for attendance can come from Finance chairperson. Add reminder to website to update us if a registrant needs to cancel. Maybe make a button for this on the webpage? Also include that reminder to email us in the Registration Closing email campaign. Be sure to access the asiawomensconference email account for changes in registration leading up to conference or that someone is assigned to update them as we receive information. Keep separate spreadsheets for online registration, walk-in registration and non-paying registration for check in. Color code lunch orders on final check-in spreadsheet for ease of use. Have registration people oversee food sticker distribution at the check-in as a function of registration instead of the food committee. If there have been extra meals ordered in advance, these stickers can immediately be distributed to walk-ins at Thursday registration until gone. All other walk-ins will need to check back on Friday morning for no-show lunch availability. We did have a few people who paid for lunch, but didn’t want it so we moved their stickers into the walk-in available lunch pile and updated the spreadsheet to reflect. Recommend the following people to help with registration - 1 Finance person to handle money and marking attendance / walk ins, 1 person for lanyards and programs, 1 person to look up lunch orders on spreadsheets and mark, 1 person to help find name tag and give out colored lunch sticker. Make larger signs (bigger than A4) for the wall indicating that there are two tables (step 1/ step 2) for registration and be sure to hang high enough that people can see over the crowds leaving the elevator. Watch the name tags at registration like a hawk! Lots of people are drawn to their names in pretty colors and may skip the payment portion / lunch sticker and just grab instead of following the process. Gently redirect to first registration table. Be sure to find out lunch order for any non-registered speakers or General Authorities / companions. Thursday night - If people haven’t had a chance to check-in yet (ie arrived late), registration will be open again at 8:30am on Friday. Remind walk-ins to stop by registration in morning if interested in lunch. Saturday morning - Remind all to return lanyard/ holders as they leave the conference and to be sure to sign-up to help in future conferences. Send out reminder email to entire gmail contact list regarding closing date. by 5 pm have set up registration table with programs, name tags, lunch stickers, lanyards, fee collection. 2. Make sure all domestic helpers, visiting authorities and last minute registrants are added. Many can only be added after the document is downloaded as we don’t have enough required info on them (email, phone etc) to register via mailchimp. Countries: many sisters have mistyped their country. For example some type Hong Kong, China, or mark their street residence instead of their city. Kuala Lumpur often needs corrections. Ask a sister from KL to review your document before sending to print name tags. 4. Create tabs for committees with customized variations of the excel sheet (see details below, in bold under ‘D) PREPARE COMMITTEE EXCEL SHEETS’). Before printing, email the 1st draft of the master excel file to the committee edit and approve. Prepare printed copies X2 per committee of their customized list (print right before flying to HK to make sure we get all the last minute people- can also reprint at business centers at the hotel). TWO copies-- One for corresponding committee members to take home and one for you to keep on you in case there’s an accident or its lost. Alpha order by attendee last name (they only need name (first/last) and country, all other columns on this committee’s tab can be delted). Sisters to be paid by HK District were highlighted on the spreadsheet. Sisters who did not have to pay were highlighted in different color. An additional column was added to the registration check-in list for notes, such as if the sister was a missionary. We had a blank form asking for name, email address, city and country for walk-ins. RECOMMENDATION FOR NEXT YEAR: Have at least 30 lines on the walk-in sheets. 2. Pick up program and put name on it. Put all lunch stickers on nametags ahead of time. Then we can take the stickers off of those that don’t show up. It took a lot of time to look up the lunches and put the stickers on as people were checking in. Keep a tally of all walk-in’s that have been given a lunch sticker at the registration table so we know exactly how many additional lunches we might need to order Thursday night. Ebenezer’s was fine with adding lunches Thursday night. WE NEED TO BUY AT LEAST 50 MORE PLASTIC HOLDERS FOR NAME TAGS FOR NEXT YEAR. Sisters to be paid by HK District were highlighted on the spreadsheet which was very helpful. We had 14 sisters register and 8 attended and were paid for by the HK District. For next year it would be nice to have a blank sheet attached to registration sheet to write the information (including email addresses and countries) of the walk-in’s. It flowed best when we had four people helping with registration, but three could also manage. Would it be possible to have a space on the online registration form to check if the sister is a missionary and therefore would not be paying? It was extremely helpful to have the cards printed with the lunch items. We knew exactly how many extra lunches we had at all times. Many sisters could not remember what they had ordered and were thrilled to have the card to remind them. We should definitely do this again next year. On the second day we had one table outside the first floor chapel so sisters could register before the opening session. Stragglers on Friday: Would it be a good idea to let the sisters know ahead of time that we will have registration from 8:30-8:55 am on Friday morning for those who do not arrive on Thursday? We had sisters arriving late on Friday and we stayed at the registration table for about 20 minutes into the first session. After lunch we just left the name tags and books on the table.